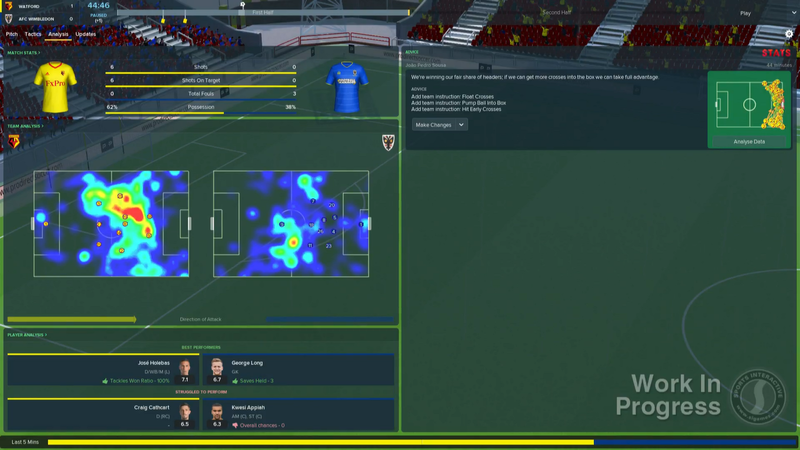 Today we’re looking at the new look Football Manager 2018 matchday experience screens. Matchday – the most important day of the week. To managers it’s either the best or worst day of the week, depending on the result. In Football Manager 2018, there are a number of innovations that make matchdays more immersive and authentic, no matter what the result. Let’s start with the Match Preview which has been redesigned for this year. You’ll notice that a lot of the information that was previously present has been more graphical and greater prominence has been given to information directly relating to the match you’re about to play. Part of your opposition scouting report has been brought into the preview too so you can view their strengths and weaknesses just before you select your team. 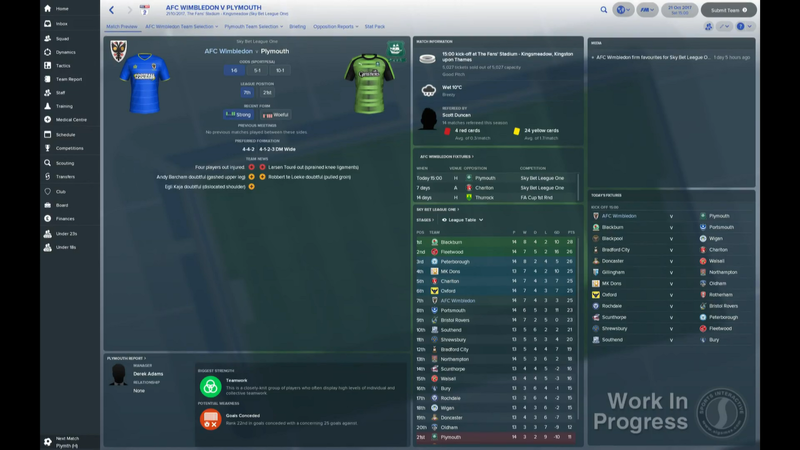 There’s also a dedicated panel for your team’s fixtures which sits alongside the league table, league fixtures and media panels that already existed in the Match Preview. The match flow, the screens you visit before the match, have changed quite dramatically this year. 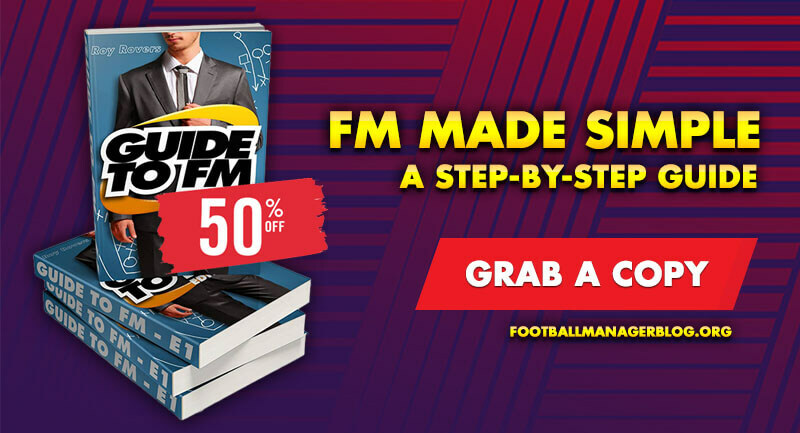 For a start, you have a tactics meeting which may happen the evening before the game, or may happen on the day of the match itself, depending on the level you are playing at. But once you’re into match day, this has changed too. With the new graphics engine in place which we’ll talk more about later, it’s given us more possibilities to showwhat we call “cut scenes”. These could be players warming up in different ways, different stadium shots, and some secrets we’ll let you discover for yourself! Once your team for the match is confirmed and the team sheets are handed in, you’ll see animated team sheets for each side before the match so you can familiarise yourself with the opposition line-up ahead of kick-off, alongside some useful commentary from the pundits on what their thoughts are on the match ahead. Next, you’re taken to the dressing room to conduct your team-talk; this is now done in a more intuitive way than the previous system. 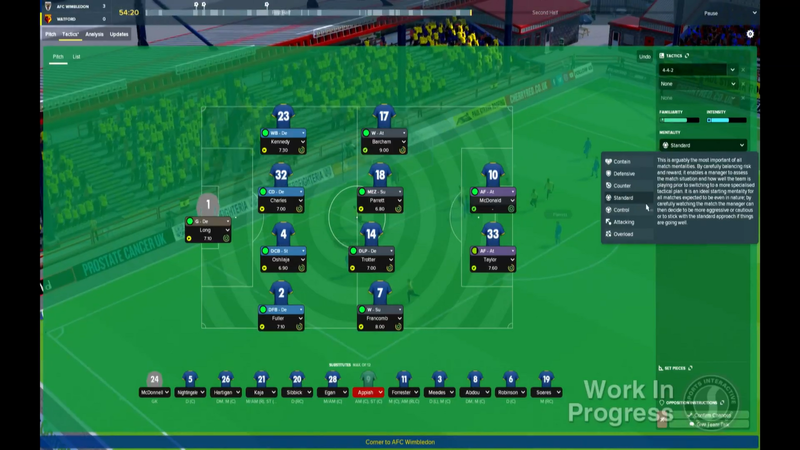 The tone system has been retained but there are more contextual team-talk options than before that often integrate statistics and data into what you tell the players before kick-off. Once you’ve talked to the team you’re presented with a summary of the squad’s reaction to your comments. You can then speak directly to the different areas of your squad, defenders for example, and deliver a secondary message to them. You can also choose to talk to individual players. Their response is displayed underneath the overall squad’s reaction. For those of you who prefer to let your assistant do the talking, the option exists to hand the team-talk over to your assistant. During half-time and full-time team-talks, stats and analysis from the match is displayed on rotation at the top of the screen. Then it’s onto the pre-match tunnel interview, should a media source want to talk to you, before the match starts. At half-time you receive a review of the first half’s action including the match events, match stats and notable performers. This is updated at full-time and also includes a summary of the result by a pundit. 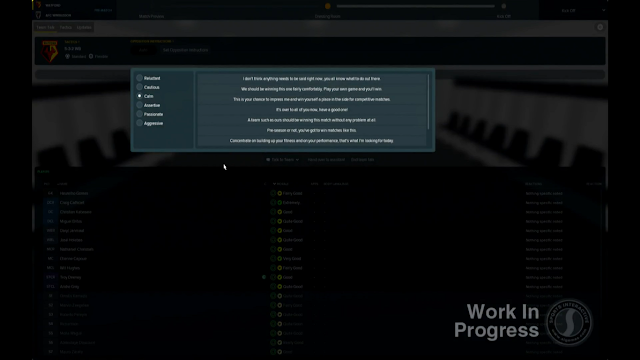 The match interface for FM18 has also been re-designed. 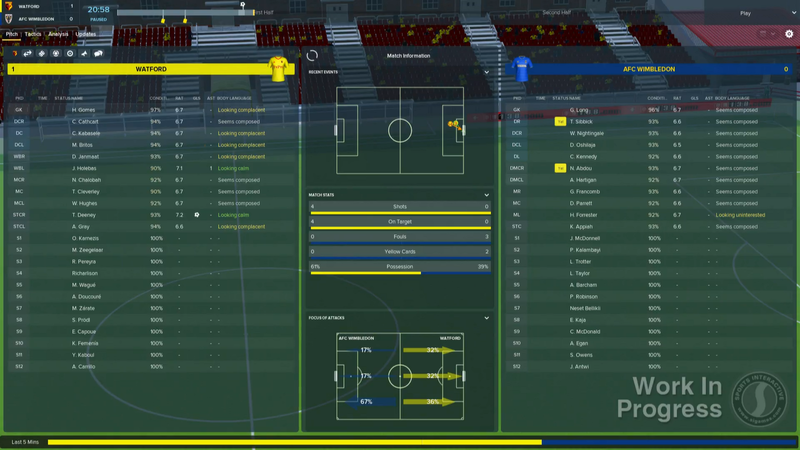 The scoreboard, match timeline and match events have been moved to the top of the screen to create a more efficient window in which to view the match action. Underneath these you’ll notice the four in-match tabs: Pitch, Tactics, Analysis and Updates. Obviously the pitch tab just shows the pitch view, but let’s look at the other tabs in more detail. 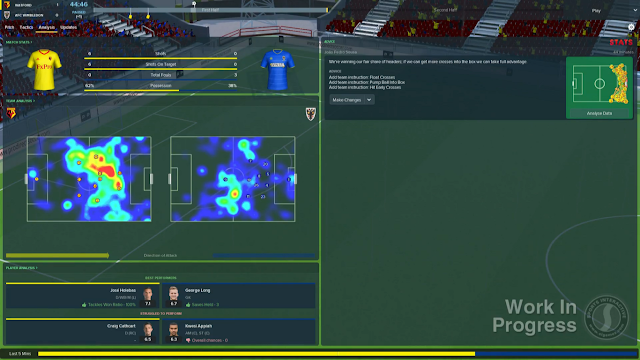 The tactics tab is where you make in-match changes, including substitutions. There’s a horizontal pitch so that it’s quicker to swap players and change player roles with the tactics panel on the right allowing you to make deeper changes to your mentality and team shape or team and player instructions. Once you’re done making changes, just hit the ‘confirm changes’ button to be taken back to the pitch view. The analysis tab shows you real-time analysis that enables you to make more informed tactical changes without having to drift far from the action. You’ll see match stats, analysis of both teams including heat maps and player analysis on who’s doing well and who needs to raise their game. 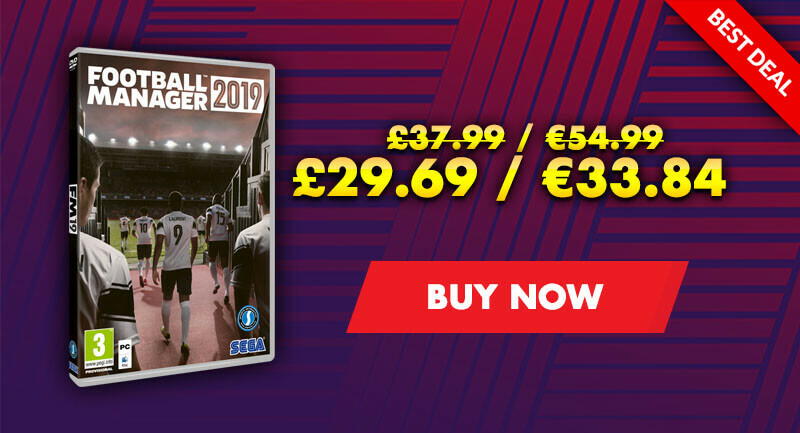 On the right side of the screen you can see any pertinent advice from your backroom staff about implementing this analysis into your tactics. The updates tab provides you with a look at the latest scores and news from other matches around the world. Away from the tabs, you can also make match setting changes directly from the match screen - this year there are several customisable cameras that allow you to change their height and zoom as well as the new option to auto-reverse the Behind Goal camera and there’s a new “widget” for this year – player watch. This allows you to view an individual player’s match statistics in isolation. 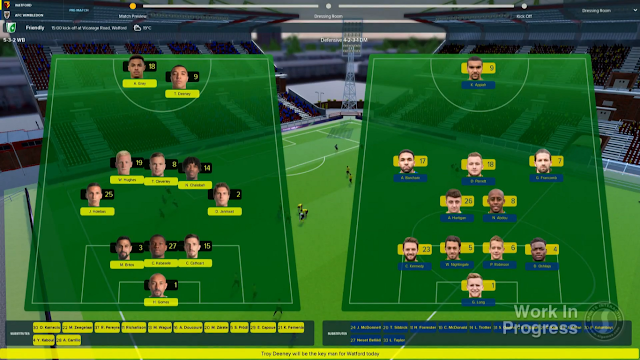 Sticking with the changes to the match view, between highlights you’ll see the new ‘RecentEvents’ screen that gives you a clear overview of the performances of both sets of players, while the central panel focuses on the story of the match so far with match stats and the focus of each team’s attack presented. 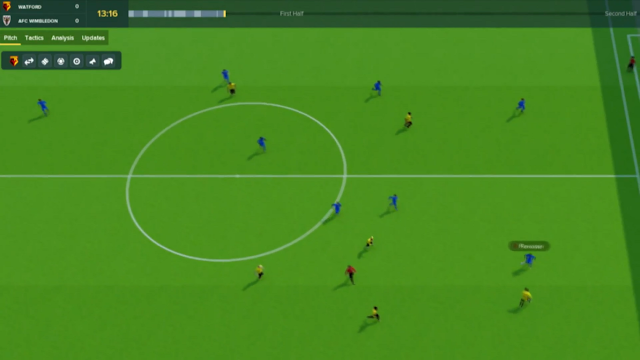 Finally, shouts have been redesigned so that you can change your team’s mentality and team shape in addition to communicating with your players from the touchline. So, I’ve kept you waiting long enough. A huge change with Football Manager 2018 is the introduction of a new graphics engine – for those of you who like tech speak, this now supports DirectX11 on PC, whereas the previous engine only had support for DirectX9. 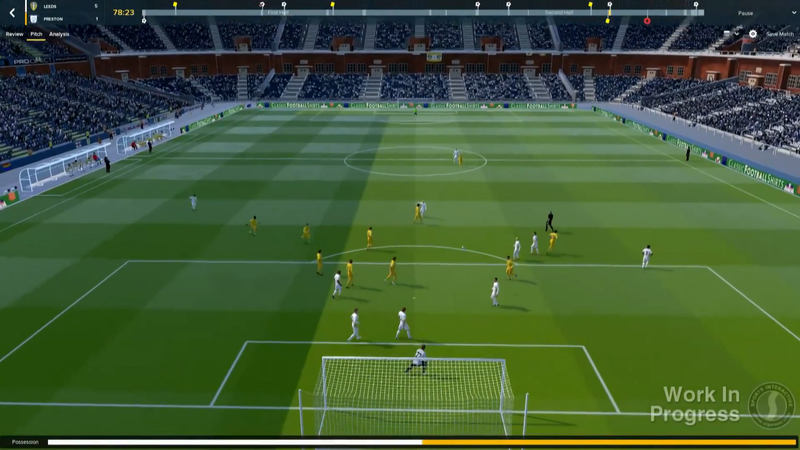 The lighting within the engine and textures of the pitch have been significantly enhanced to make the match action look better than ever, and also makes it easier for the match view team at SI to make changes in the future. 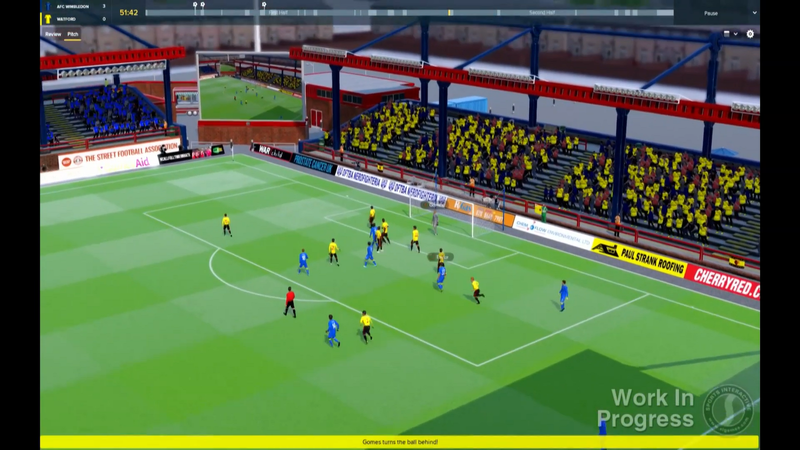 It’s not just the background tech that has improved, but the graphics have too – our art team have worked closely with our sister studio at The Creative Assembly this year to improve the player models and stadiums. There is now more variation between one player to the next in the match engine. This affects how a player moves around the pitch and operates on the ball which leads to a more authentic portrayal of the players during a match as a result. Stadiums have been greatly improved too. 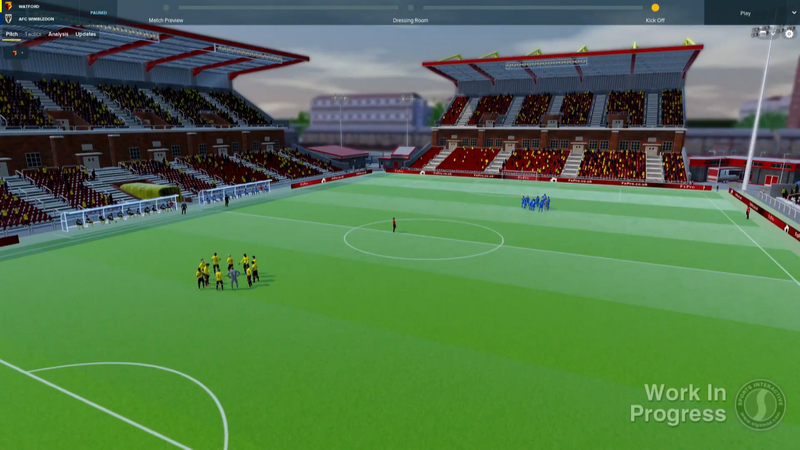 They now look sharper with more features included both in and around the stadium and there’s more variety in the type of stadiums as well. 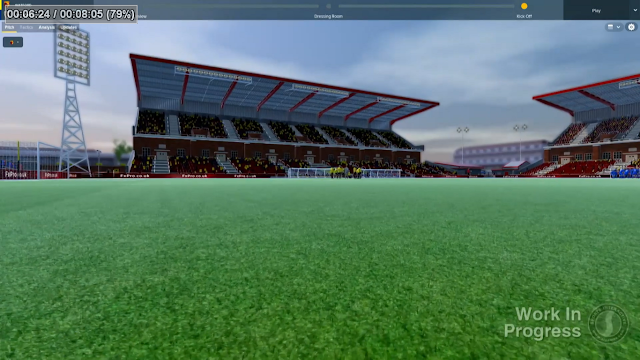 You’ll feel even more a difference between the size and scale of a 70,000 seater stadium and a 7,000 seater one – and some of the cut scenes show the stadiums off so you’ll be able to get a better view of where you play the matches. 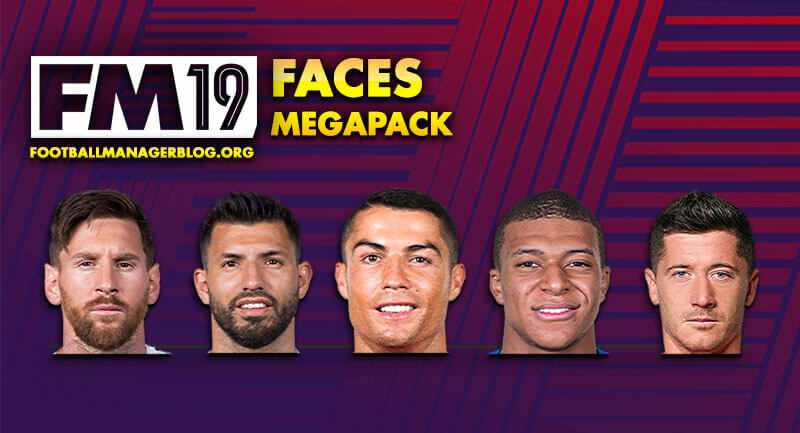 Ultimately, the new graphics engine creates more opportunities for development and you can expect to see some exciting innovations to the matchday experience over the next few years thanks to this work. Away from the new graphics engine there are hundreds of new motion-captured animations with particular focus given to goalkeepers to ensure that they move and react in a more realistic way, alongside new shots, controls, passes and celebrations also made possible with the help of CA and their motion capture studio, directed by our own match view team. Of course, there are also lots of AI changes to the way the players behave on the pitch. 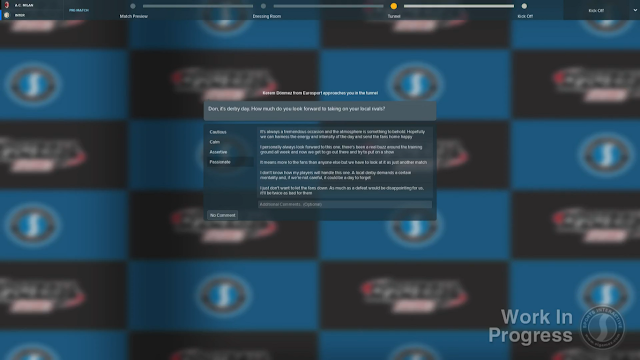 We’ll be providing some match engine videos in the run up to release so you can see some of these improvements yourself then. And after the game, should you want to get full analysis on the match from your data analyst, there are lots of additions to what is analysed including spaghetti maps, clear cut chances, combined top pass table, multiple position data columns and a much improved heat map. That’s just a glimpse at this year’s match day experience - hopefully that’s whet your appetite. 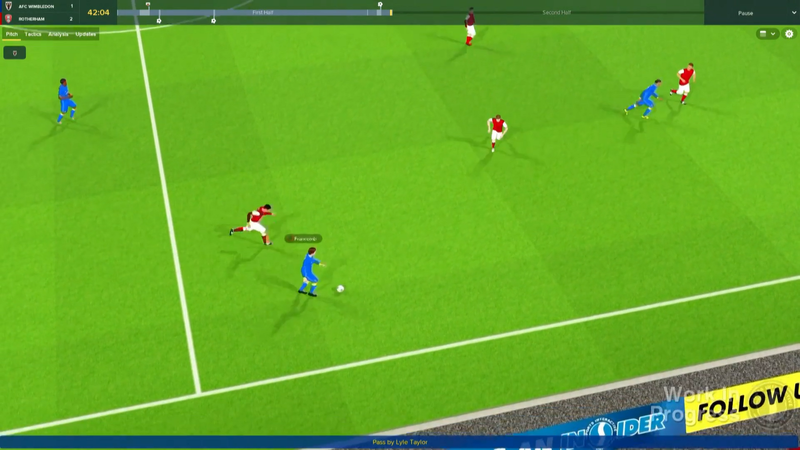 You’ll be able to see plenty more of the match engine in action ahead of the release of Football Manager 2018 on November 10th. 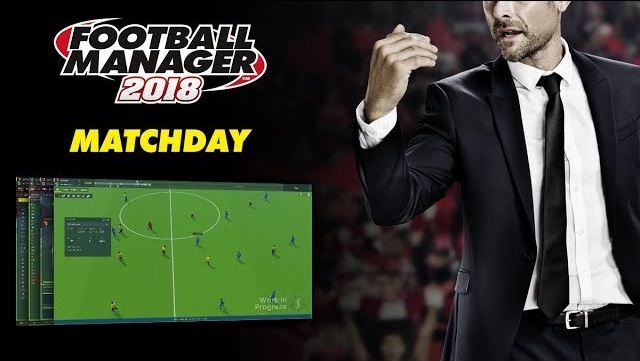 Today we’re looking at the new look Football Manager 2018 matchday screens.